Cosmo is telepathic dog that lives in space. Cosmo befriends the Guardians of the Galaxy and helps the team on many of their adventures. Cosmo is a relatively new character his first appearance was in 2008. He makes an appearance on Knowhere Station in Nova #8 (2008). 2008 you will find is an important year in Cosmic comics of Marvel because this is the beginning of Abnett /Lanning team up that totally transforms the Marvel Cosmic Universe. These years give us new characters like Cosmo and also dusted off old, forgotten characters like Rocket Raccoon. That series is the foundation for the film Guardians of the Galaxy. The exact origins of Cosmo are still a mystery but it is based off of real events in the Russia Cosmonaut program. The space program in Russia initially launched dogs into space to see if it was safe for Humans. If an alien species had been watching our planet one of the first species they would have seen launched in space would have been a canine. They could have found the dog and wanted to communicate with it and so they gave the dog the power of telepathy. This could be Cosmo's origins. Nova Rich Rider encounters Cosmo on the station Knowhere. On the station Cosmo serves as a Security Officer. Nova was very surprised to find an Earth dog that could talk on the edge of the universe. The two quickly become friends and join forces to stop a spate of murders on Knowhere. The pair found that the villain Abyss was behind the deaths and combined forces to beat and imprison the villain. As a parting gift Cosmo gave the cordinates to the birthplace of the Phalanx to Rich Rider so he could find a cure to the Transmode virus. Nova was followed by a murderous Phalanx controlled Drax and Gamora and Cosmo was unable to stop them. Cosmo becames a liason between the new Guardians of the Galaxy led by Star Lord and Knowhere station. The group uses the Knowhere station and the technology there as a base for a time on its adventures. Cosmo like Rocket Raccoon comes off as a bit silly at first. A telepathic space dog? As you read stories about him though you really start to love him. In the end I have decided he is in many ways more believable than many other Marvel characters. What a telepathic dog is more believable than a rocket human? Well lets just say he is similarly believable. 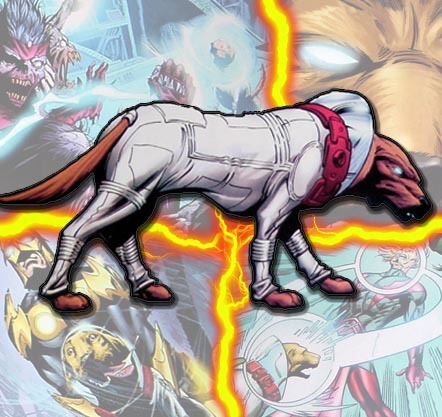 I think Cosmo may make a brief appearance in the Guardians of the Galaxy movie. Watch for a dog in the Collector's museum.